Although these two lizards are quite closely related, they are both shown because they represent the only poisonous lizards in the world. Certain varanids do show some enzymes in their saliva but none is even mildly poisonous. 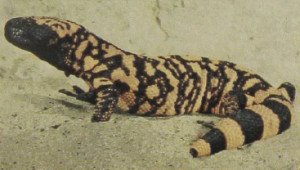 The Gila Monster is found in the extreme southwestern United States starting from southern Nevada and southeastern Utah to Sonora; the Mexican species ranges south, almost to the Guatemalan border. These medium-sized animals – total length being about 2 feet for the northern and almost 3 feet for the southern form – are quite stout and easily recognized by the blunt head, fat, rounded tail, and scales that appear as if the surface were raised into pebbles. 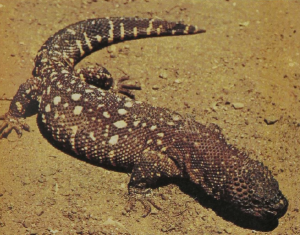 Both spend much of the day In tunnels or crevices and emerge at dusk to hunt for the young of ground-nesting birds, small mammals, and reptiles. The teeth of both the upper and lower jaws are fluted and show deep grooves on their outside. The glands of the lower lip produce a potent venom which has to be introduced into prey by chewing action. While the venom is very effective for small mammals there appear to have been no human fatalities directly attributable to bites. However, even though most human victims recover, it is clear that these animals should be treated with great caution.